El Centro de la Raza is hosting a community meeting on Saturday, February 19, from 10 a.m. to 1 p.m. to discuss ideas and planning for the development of the El Centro south lot. All are welcome, and food will be provided. Please RSVP to Miguel Maestas at 206-957-4650 or at associate@elcentrodelaraza.org. The meeting will be held at the Cocina located on the first floor of the north end of the El Centro de la Raza building, 2524 16th Avenue South. El Centro is also working with a group of business students from the University of Washington to develop recommendations for the future mixed-use, transit-oriented development on the south lot. The students have created an online survey, to gather Beacon Hill residents’ opinions about the small businesses they would like to see in the development. Here’s a link to the survey. What will this bleak lot become? Photo by Joel Lee in the Beacon Hill Blog photo pool. I am completely sympathetic to El Centro’s need to produce income for their programs while we wait out the zoning process, and I’m excited to see what the long term development will bring to the community. However, I don’t think that a parking lot will add much of anything other than traffic, and it seems like El Centro could develop something, even temporarily, that would coincide better with their values of building the community and serving low income families. Here are just a few ideas to get the ball rolling, with hopes that we can think of more. A mercado booth. Photo by Victor Ramiro via Creative Commons. A mercado or traditional Mexican market. 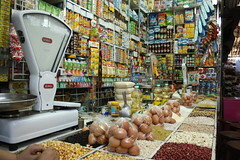 Stalls are rented for low prices and merchants offer a variety of goods. Mercados in Mexico are crowded, noisy, and kind of amazing. They are full of people shopping and offer choices for low income merchants and buyers to get their foot in the door. A community garden. Although it wouldn’t be a big money maker, it could directly produce food for low-income people. There are plenty of crops that can be grown year round here with a little help, and classes could be offered. Plots could be given to low-income people and rented to others. Food carts. How much fun would it be to have a choice between a variety of food carts for any given meal? Food carts can be very minimal, sometimes just a cooler strapped to a bicycle or a lemonade stand. Again, giving low-income people a chance to get their foot in the door of our economy. Farmers’ markets tend to be seasonal, but I still love them. Even if it were only one day a week, it would leave the space open for other activities the rest of the week while bringing locally grown produce to the community and generating income. I know that we are already getting a skate park, but I would love to offer up a place for young people in the community to gather. Probably not a big money maker, but still a good idea. Bring back the basketball court? I know that mini-golf sounds like a weird idea. But think about it. A great family activity, and with a little shelter, it could be a year-round destination. Build some kind of giant Godzilla statue eating the Eiffel Tower and this could put Beacon Hill on the map and employ a lot of people. We don’t really need a bookmobile since the library is so close, but as a kid this was a highlight of my youth. What other social services or small companies could be brought to the community by truck? Flower shop? Kite shop? Toy store? Everyone loves a flea market, right? A slightly less-permanent version of the market, it offers a chance to socialize and meet neighbors while you sell your old junk and obtain new junk. Another good foot in the door of the economy. There has been a lot of talk about creating an outdoor cinema, but it’s hard to imagine a better area than next to the light rail station. It could become a destination for people all along the light rail line and could be in conjunction with many other uses. What about a mini amusement park? Many rides are designed to be portable and could be cleared out when the time comes to build more permanent structures. Lets be honest, if we had a giant Ferris wheel I would ride it every day. Wouldn’t you? 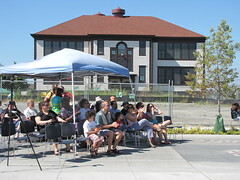 Neighbors enjoyed a Beacon Rocks performance on Festival Street last summer. The El Centro building and the proposed parking lot site are in the background. Photo by Wendi. 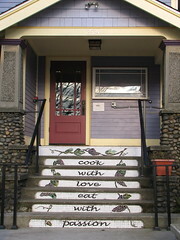 Beacon Hill is (and historically always has been) a community of mixed incomes, cultures, ages and lifestyles. I am sometimes teased by friends from other ’hoods for what seems like excessive neighborhood pride, but there’s a lot to be proud of! Our Neighborhood Council is an active and effective voice for the community, and meetings are almost always respectful and productive. Even comments on our neighborhood blog manage to stay civil most of the time. I hope we can maintain the positive and productive tone as the process moves forward to plan the next stages of development activity at El Centro de la Raza. El Centro staff, volunteers, patrons and tenants are part of our Beacon Hill community. I don’t understand the “us versus them” tone that creeps into conversations and comment threads about El Centro—especially when we’re all in the same room. We share the same goals and priorities: making Beacon Hill safe, vibrant and successful for everyone who lives, works, plays, studies and shops here. El Centro de la Raza is working towards a goal to develop affordable housing, commercial space, and a public plaza. They are trying to build the “beloved community.” The need is real and the goals are attainable. While the process of changing zoning around the light rail station moves forward, El Centro is trying to activate their now-vacant south lot. They want to encourage vendors and food trucks, and to improve security and pedestrian access. They also need revenue and are proposing a gravel parking lot with 80 spaces for commuters and sports fans. In 1972, the “Four Amigos” inspired countless volunteers to pressure elected officials for access to a space that would become a community meeting place. 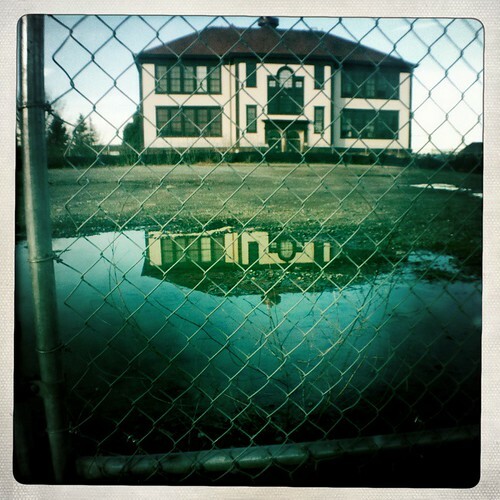 The original Beacon Hill Elementary building was vacant and seemed an ideal location. 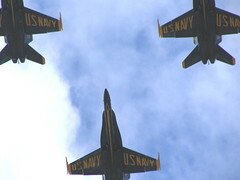 Their passion and dedication still inspire 38 years later. El Centro de la Raza is the Center for all Peoples. The name is Spanish; the roots and mission multicultural. Roberto Maestas is the man best known for the occupation that led to El Centro’s foundation, but a photo of those involved in the occupation would make a classic Benetton t-shirt. Today, the people who seek services (and those who provide them) are astonishingly diverse. Blonde acupuncture clients share the halls with East African mothers picking up children who learned Spanish with their Filipino classmates. Ukrainian seniors wait in line at the food bank staffed by Latino volunteers coordinated by an Asian AmeriCorps leader. El Centro’s clients and staff are more than culturally diverse. They also represent the economic diversity of Beacon Hill. The food bank and meal programs help our hungry neighbors. All services are supported by donors and volunteers who have extra time, money, or other resources to share. Several small businesses and independent nonprofit organizations thrive as tenants in the building.. Public art and cultural events are offered throughout the year. El Centro is also the new home for Tots Jam, the toddler music class that started at ROCKiT space. In addition to the work that goes on inside the building, El Centro advocates for and represents those in our community who might not otherwise participate in the political process. Through translation services, advocacy training, public meetings hosted at accessible times, and other means, El Centro staff and volunteers engage and inspire the community. I’m not thrilled about parking lots on Beacon Hill. I don’t like any part of the idea. However, I’m willing to support El Centro’s efforts to build a temporary lot while the slow zoning process moves forward. A safe, accessible area with vibrant small businesses is a better short term use of this area than an empty lot. Some small income to help support programs is better than nothing. El Centro is a vital part of the incredible community I’m proud to call home. They need our help so they can help us. Oh, by the way… a group of diverse community activists are working to secure public meeting space on Beacon Hill. The North Beacon Hill Council is working with the Beacon Hill Merchants’ Association and other groups to request free access to office space in the library. We need a place to share community information and provide storage and meeting space. Please contact the Mayor’s Office and City Council members to support our efforts. We’re not asking people to occupy the space—an email or tweet should suffice. On Sunday, the door will close on Tasha's Bistro Café. Photo by Wendi. It is with great sadness that Tasha’s Bistro Cafe will be closing our doors after breakfast on Sunday, November 7th. We have enjoyed meeting each and every customer over the past several months. Your support has been great, however it is apparent that with the economy, we are unable to sustain our type of restaurant in Beacon Hill without an investor or interested restaurant owner. More from Tasha in the original post. While people are talking about forming a new merchants’ association on the Hill, it’s a good time to look at some of our current merchants (in North Beacon Hill, at least). 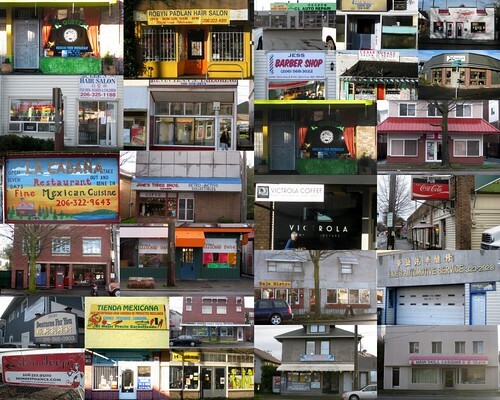 Joel Lee put together this great collage of North Beacon’s small businesses, and posted it to the Beacon Hill Blog photo pool on Flickr. How many of these businesses have you patronized? If you have interesting photos of Beacon Hill, we’d love to see them in the pool, too!